There really isn’t anything more fun than a blow torch at a party – an adult party, that is. They are fun little tools if used safely. And, a nice little show to guests. 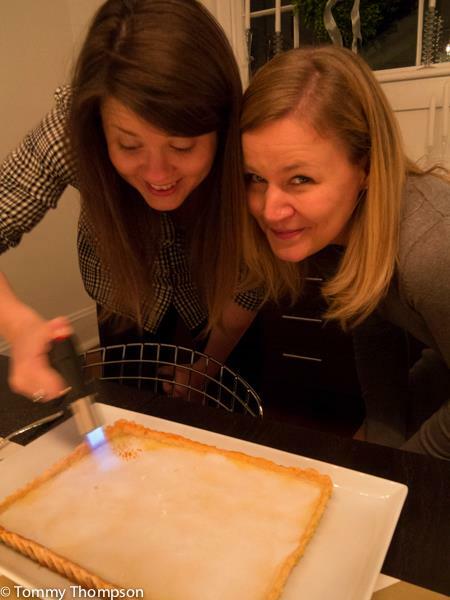 We passed the torch around (literally) on Thanksgiving to burn the sugar on top of the homemade Creme Brulee Tart. This dessert, again, is for a special occasion. The recipe has plenty of steps that will take time in the kitchen. However, the combination of buttery crust and burnt sugar custard is worth the extra time and energy. And finishing the product with friends is too much fun. Whisk together flour, sugar, and salt in a large bowl (or pulse in a food processor). Blend in butter with your fingertips or a pastry blender (or pulse) until mixture resembles coarse meal with some roughly pea-size lumps of butter. Add 3 tablespoons water and stir into flour (or pulse) until incorporated. Gently squeeze a small handful of dough: If it doesn’t hold together, add water, 1/2 tablespoon at a time, stirring (or pulsing) after each addition. Do not overwork dough or pastry will be tough. Turn out dough onto a lightly floured surface and divide into 8 portions. With heel of your hand, smear each portion once in a forward motion to help distribute fat. Gather dough into a ball, then flatten into a 5-inch disk. Chill dough, wrapped in plastic wrap, until firm, at least 30 minutes. Roll out dough on a lightly floured surface with a lightly floured rolling pin into a 13-inch round. Fit dough into tart pan and fold overhang inward to reinforce side. Chill until firm, about 30 minutes. Lightly prick bottom of shell all over with a fork, then line with parchment or foil and fill with pie weights. Bake until edge is pale golden and side is set, 20 to 25 minutes. Carefully remove weights and parchment and bake shell until golden, 10 to 15 minutes more. Remove tart shell from oven and reduce temperature to 300°F. While shell bakes, split vanilla bean lengthwise and scrape seeds into a heavy medium saucepan with tip of a paring knife. Add pod to saucepan with cream and milk. Heat over medium heat until hot, then let steep off heat 30 minutes. Whisk together yolks, whole egg, 6 tablespoons sugar, and salt in a quart measuring cup, then whisk into cream mixture until smooth. Strain through a fine-mesh sieve back into measuring cup. Put tart shell (in pan) in a 4-sided sheet pan. Put in oven, then pour custard into shell. Bake until just set but still slightly wobbly in center, 30 to 35 minutes (custard will continue to set as it cools). Remove tart from sheet pan and cool on a rack 30 minutes. Remove side of pan and cool to room temperature, about 1 hour more. 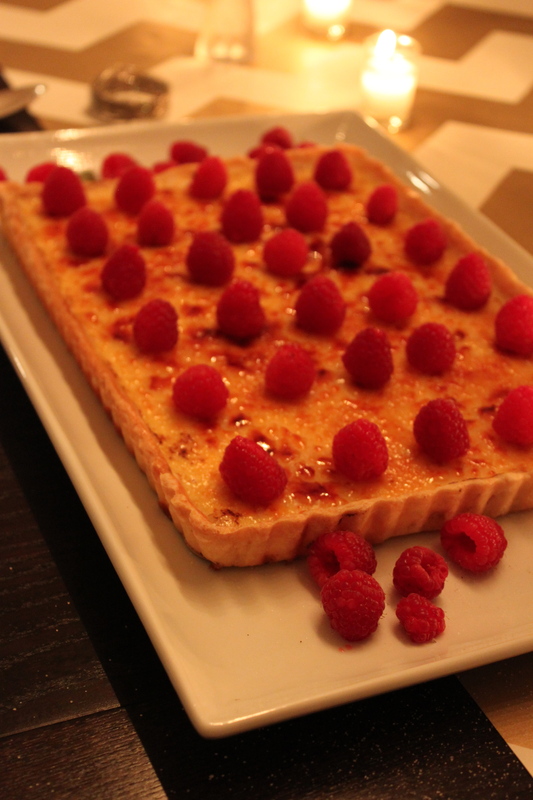 Just before serving, sprinkle remaining 2 tablespoons sugar evenly over top of tart. Move blowtorch flame evenly back and forth just above top of tart, avoiding crust, until sugar is caramelized and slightly browned. Let stand 5 minutes before serving.